Led by Associate Professor of Biology Memuna Khan and Professor of Biology and William Harley Barber Distinguished Professor George “Skip” Wittler, the students are exploring Costa Rica’s riches in biological diversity and its relative success in conserving them. Students will travel throughout the country and implement a field study to compare biodiversity and communities across the ecosystem types of lowland rainforest and cloud forest. Visits to public and private reserves and discussion of these different approaches to conservation will be discussed. Discussions of assigned readings as well as of each day’s activities will occur. What follows is the first in a series of reports shared by students in the course. We started off 2018 by landing in San Jose, Jan. 1. Our eight students on this journey are instructed by Professors Memuna Khan and Skip Wittler. Thus far, our time has been spent in the central valley of Costa Rica and a dry-forest life zone. We learned that “Pura Vida!” is philosophy of Costa Ricans that translates to “Pure Life!” An example of this is the cleanliness of the water; it is 90 percent potable and is the cleanest drinking water among the Latin American countries. For many ticos (a term commonly used by the Costa Rican people use to themselves) — particularly those in rural areas — water is essential for their life and livelihood. In recent years, developers have attempted to take water from Costa Rica’s rivers for commercial use. This would be at the detriment of many of the locals that rely on the natural resource. Because of this, some communities have risen up to defend their constitutional right to access water. We visited the Sustainability Demonstration Center located in Guacimal that was founded during a grassroots movement for water rights and whose mission is environmental protection, animal welfare, and political and social justice. We ventured to the Guacimal River and toured the area around the sustainability center. The river attracted a wealth of wildlife. While there we saw a variety of birds such as humming birds, flycatchers, a kingfisher and a Hoffmann’s Woodpecker (which is endemic to Costa Rica). Additionally, we saw a mating pair of Black-Striped iguana (Ctenosaur). While trekking down the river, we heard ominous whooping from the treetops. Across the river was a troop of Golden-Mantled Howler Monkeys perched in a tree. There was some expectation to hear the howler monkeys in the area we were exploring, but it was a surprise to actually see them. Despite the considerable distance between us and the troop, their calls resonated quite clearly through the area. This is due to the overdeveloped hyoid bone in the howler monkey’s throat allowing it to project its howls across long distances. 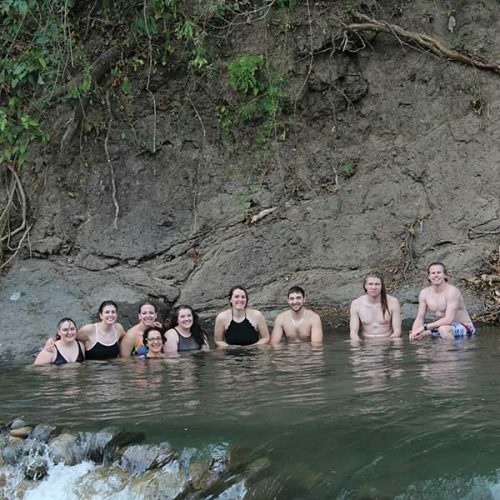 At the end of our river tour, we swam in the river. The locals build up stone pools that allowed leisurely swimming without being swept away by the current. The water was cool and clear; the locals swimming were certainly living la pura vida by lounging and laughing in the pools. Our journey thus far has demonstrated that not only is animal welfare and environmental protection essential for preserving biodiversity, but water sustainability is a crucial facet of conservation. Stay tuned for the exploration of the cloud forest of Monte Verde. Posted January 3, 2018 in Academics, Student, Sustainability by Ric Damm.